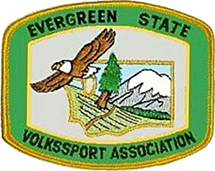 We are a walking club, associated with America’s Walking Club, also known as the American Volkssport Association. We offer fun, fitness, and friendship through non-competitive walking events. We are known as the Holiday Club because we sponsor organized events on and around holidays – New Year’s Eve and Day, Easter, Independence Day, Labor Day and Halloween. And we host many year-round-events in Seattle. Join us for supper and socializing. We would love to have you. Dues are $5 per year, which entitles you to work at our walks (some reward, eh?) and to good company and fun. We are a diverse group that enjoys walking as well as each other’s company. More info: send a note to Mike. Location: Burien Roundtable Pizza, 15730 – 1st Avenue South. Supper (no-host)at 6ish PM; meeting at 7:00 PM. Easter Weekend Walk: Saturday, April 20, we return to the former Weyerhaeuser Campus – now the Greenline campus – in Federal Way. Walk through the 500 acre campus, the Rhododendron Species Botanical Garden and the Pacific Rim Bonsai Collection. The 10K and 5K routes are on good trails with a few moderate hills. Walkers can start anytime between 9 AM and Noon. And, there is an award available for $9. It’s a multi-colored, embroidered patch featuring the John Shethar Memorial Trail. Directions: Exit142A from I5 – LEFT on SR 18E toward Auburn. Take the Weyerhaeuser Way S. exit. LEFT on Weyerhaeuser Way thru roundabout to Weyerhaeuser Road (first LEFT after the roundabout). Follow signs to Garden Parking lot on RIGHT. July 4: Our Independence Day event will be a guided walk on Beacon Hill in Seattle. There will be two start points – Jefferson Park Community Center for those who drive to the event; Beacon Hill Light Rail Station for those who use LINK. Both routes will qualify for the Light Rail program. More details to come – check here or the NW Pathfinder. Labor Day: Saturday, August 31, starting at Seattle University. Halloween: Saturday, October 26, at Remlinger Farms, Carnation. New Year’s Eve and Day: West Seattle. NATIONAL PARK ANNIVERSARY SPECIAL PROGRAM: In 2016, the National Park Service celebrated its Centennial – 100 Years! The Emerald City Wanderers club sponsors an AVA Special Program to honor that Centennial. More details here.